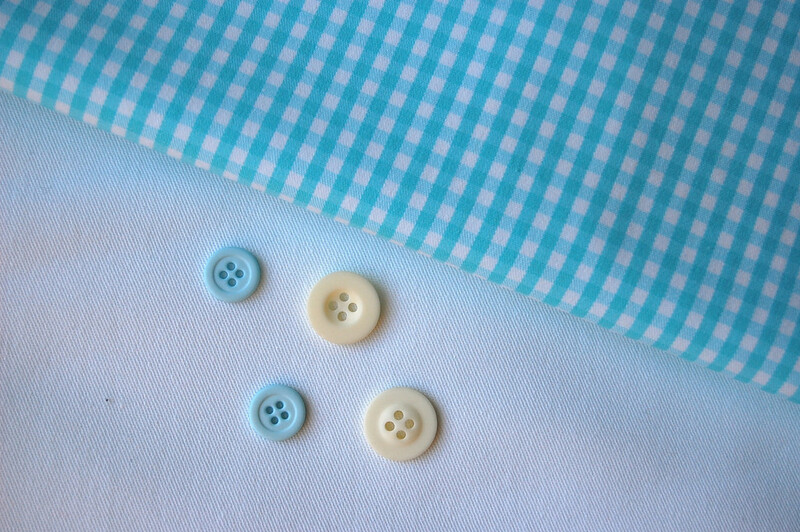 pattern pieces. You need to add your own! Step 1 -Cut the yoke and armscye facing. You'll need two armscye facings (one for each armhole) and two outer yokes (front and back). 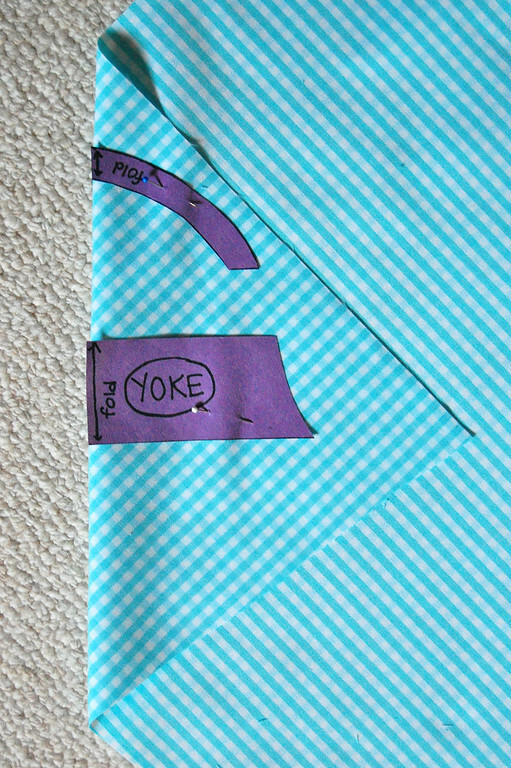 You'll also need two inner yokes (front and back) cut from a lining fabric. Mine (as you will see in later pictures) were white. Q: Must they be cut on the bias? A: The armscye facing - yes, because it will go on like bias tape and needs to hug the curve of the armscye. The yoke - no. It can be cut along the grain but I liked the contrast of the pattern direction. You can cut the straps on the bias or on the grain. I prefer cutting them on the bias because they conform to the curve of the shoulder better, and provide a nice continuity to the curved armscye. 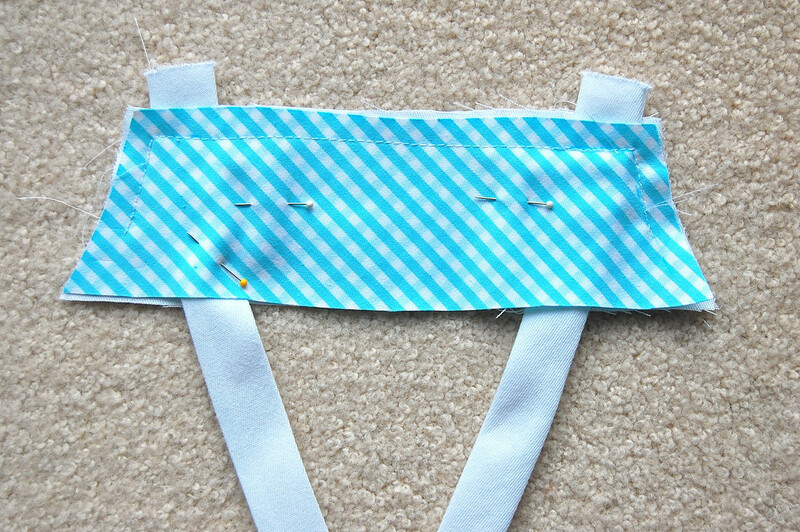 You can also use wide double-fold bias tape (top-stitched shut) for the same effect. 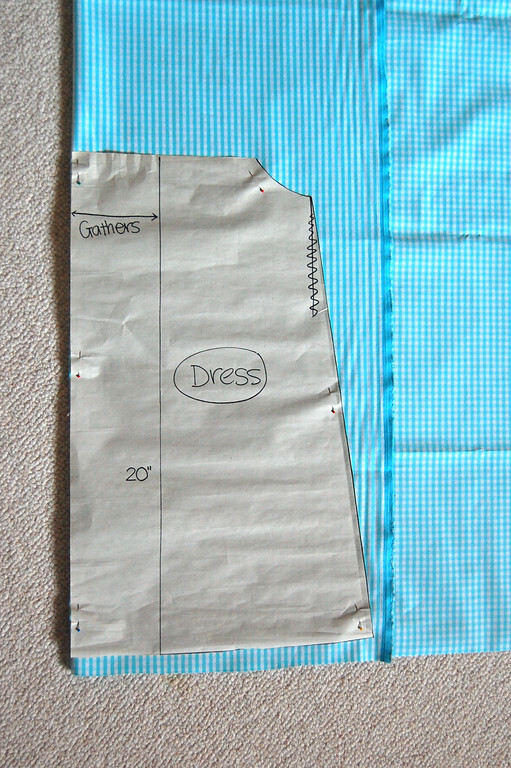 For a smaller gathers ratio, fold the gathers column vertically to make it narrower overall - see the photo below. For the 1.5X ratio, I folded the gathers column itself in half. For no gathers at all, fold the gathers column vertically along the line to remove the column totally. 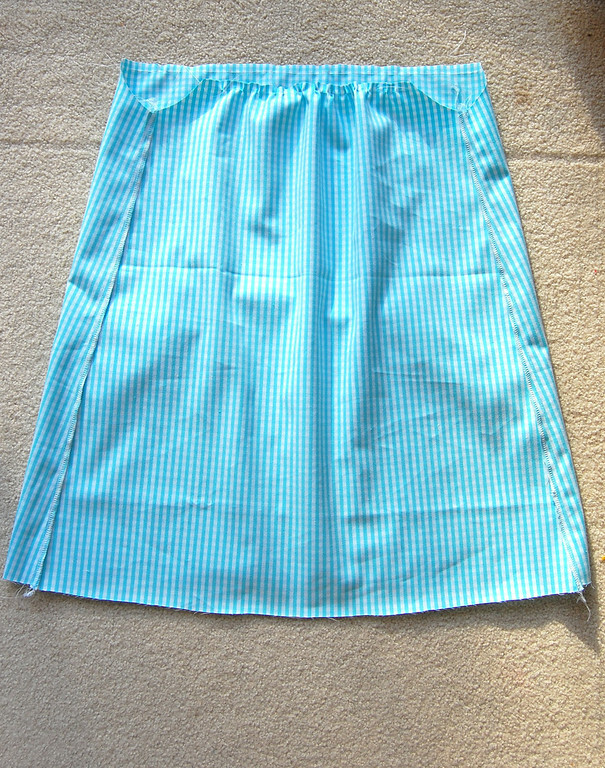 The only embellishment I added before sewing up the sides was a pair of welt/stand pockets. I wanted something very minimal and somewhat tailored and formal. 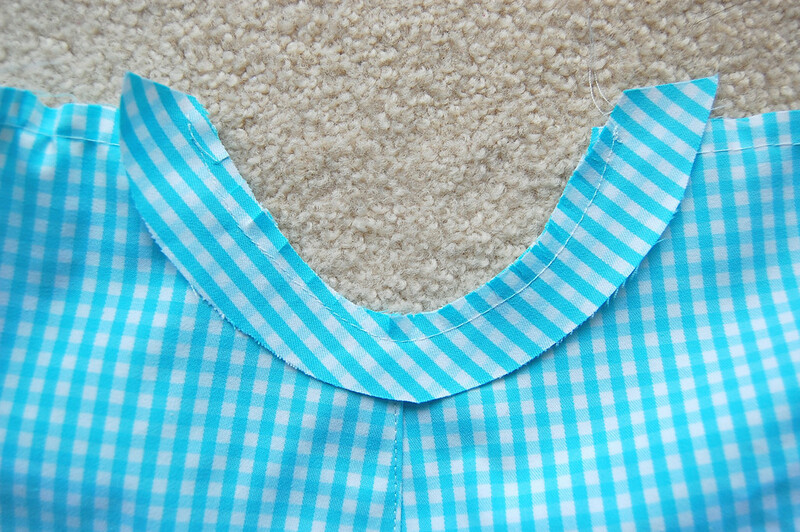 You can do this at any point in the sewing process before attaching the yoke. 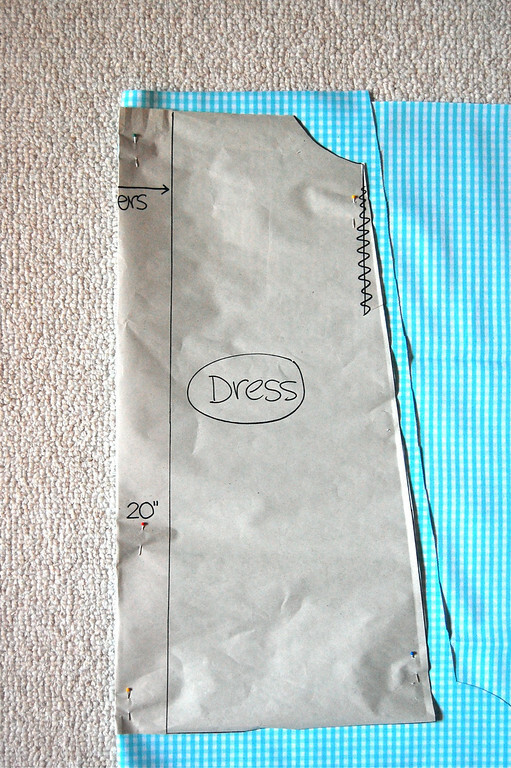 Sew long running stitches close to the top of the front dress piece and gather so that the width matches the bottom of the yoke. 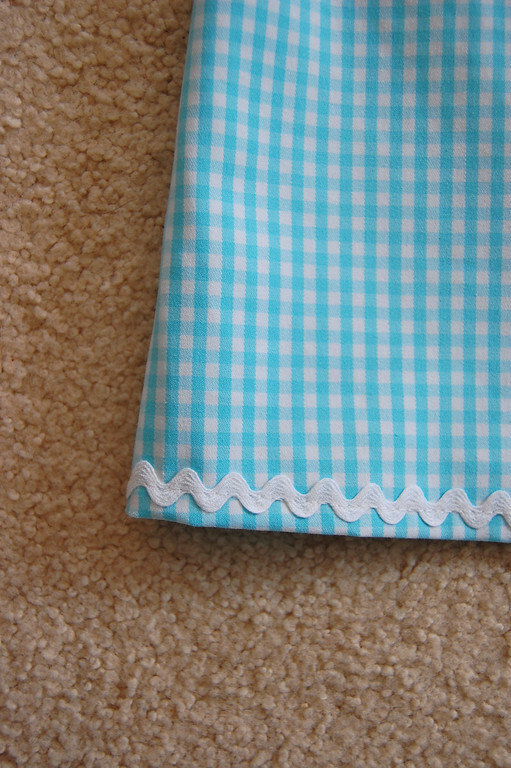 Sew up the side seams and finish/serge the edges. Line up the upper edges of the facing and the armscye, right sides facing and pin/baste in place. 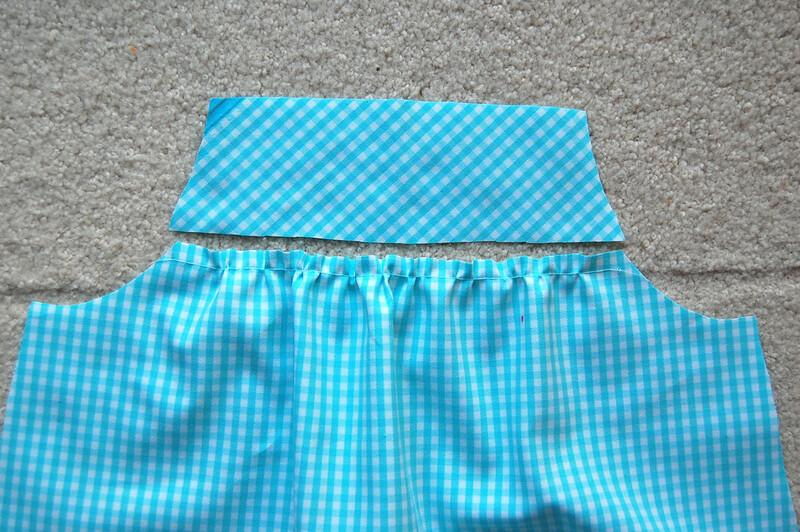 Trim and snip/notch the seam allowance. 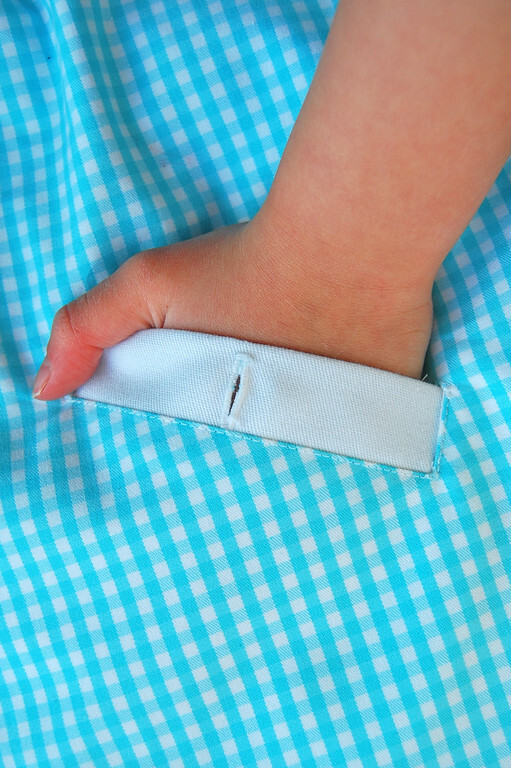 Fold over to the wrong side of the garment. 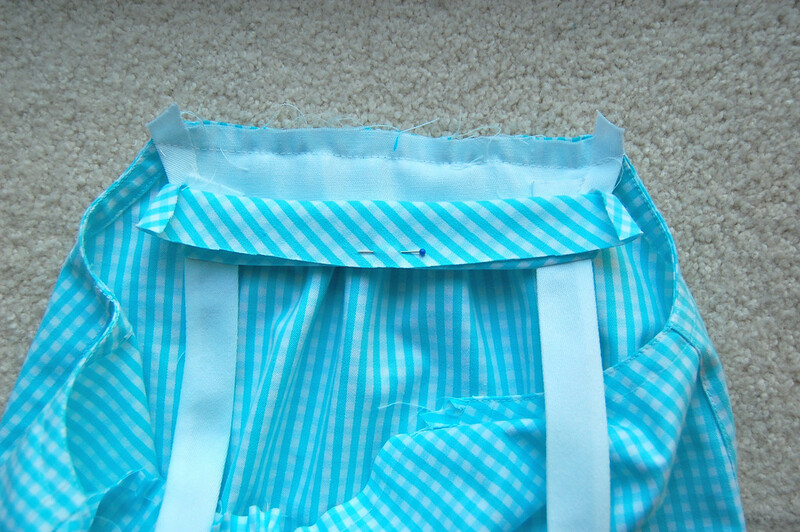 Fold the bottom edge of the facing under and baste. I wouldn't recommend pinning, unless you don't mind a lot of pulling and warping. 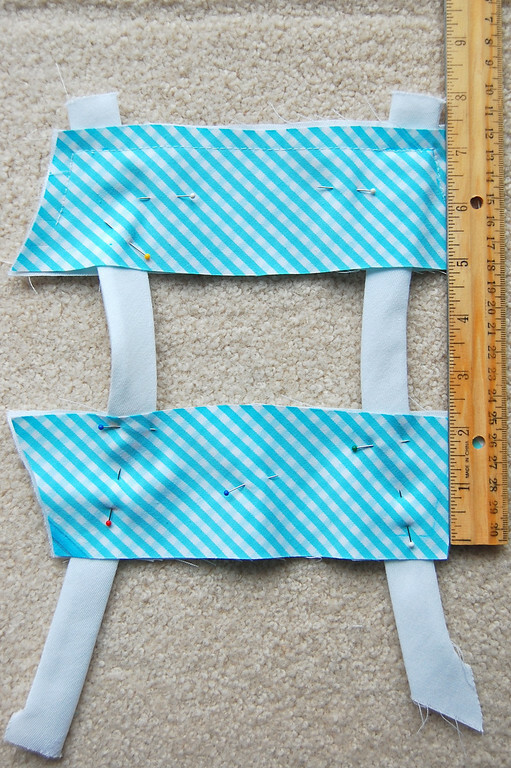 There are many ways to make the yoke-straps-dress assembly. 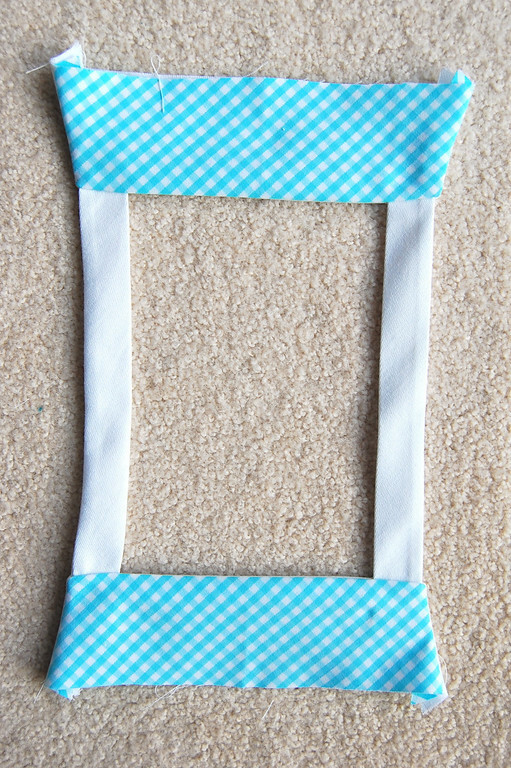 You can attach the straps last, which allows you to adjust their final length. I like to attach them first because it minimizes shifting around, which makes them crooked, which is particularly noticeable with a curved yoke. Sandwich the straps between the outer yoke and its lining (which are right sides facing), pin in place and stitch. 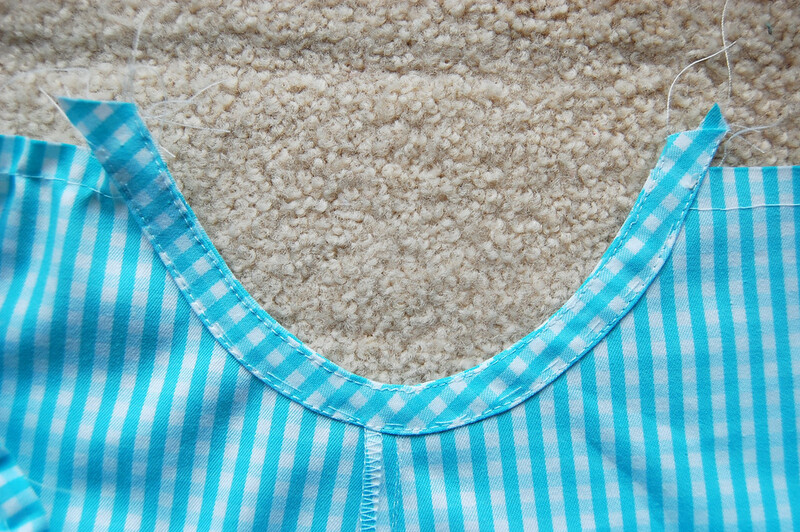 Do not stitch all the way to the lower edge of the yoke - leave some seam allowance for tucking in. Repeat for the other yoke-and-lining. I wanted my straps to be about 7" long so this is the distance from the stitching line of one yoke to the stitching line of the other. 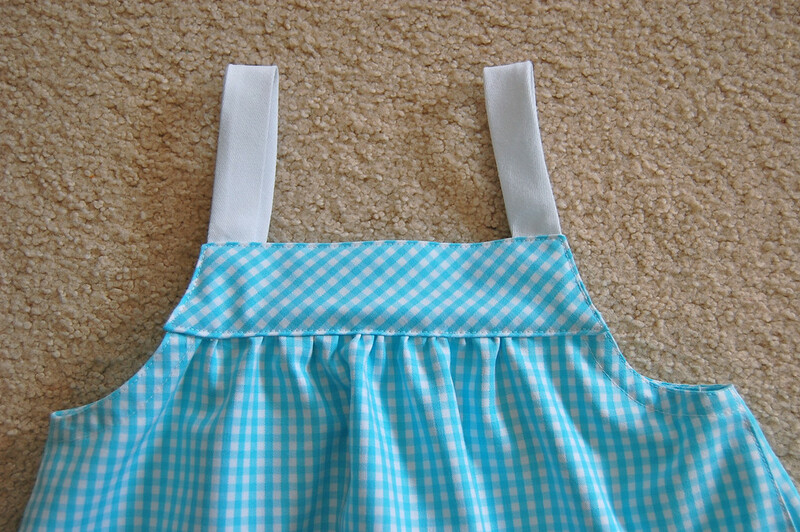 Place the lining of one yoke along one gathered top edge of the dress (say, the front of the dress), so that the right side of yoke lining faces the wrong side of the gathers. 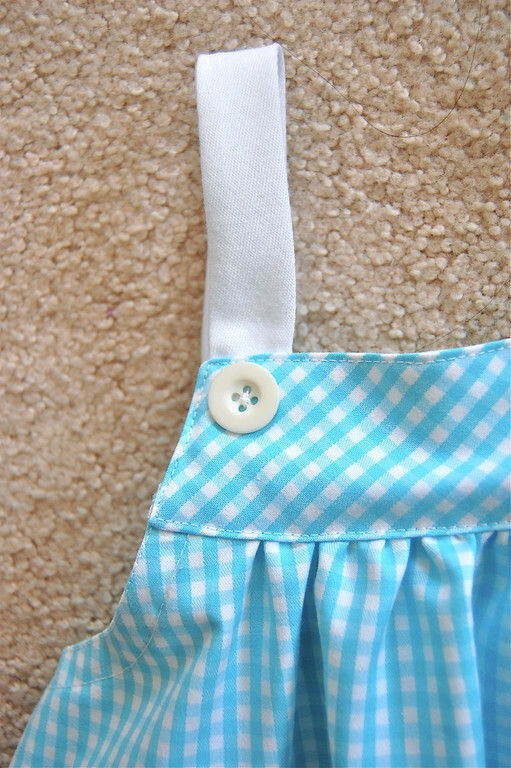 The outer yoke is pinned back in the picture for visibility. 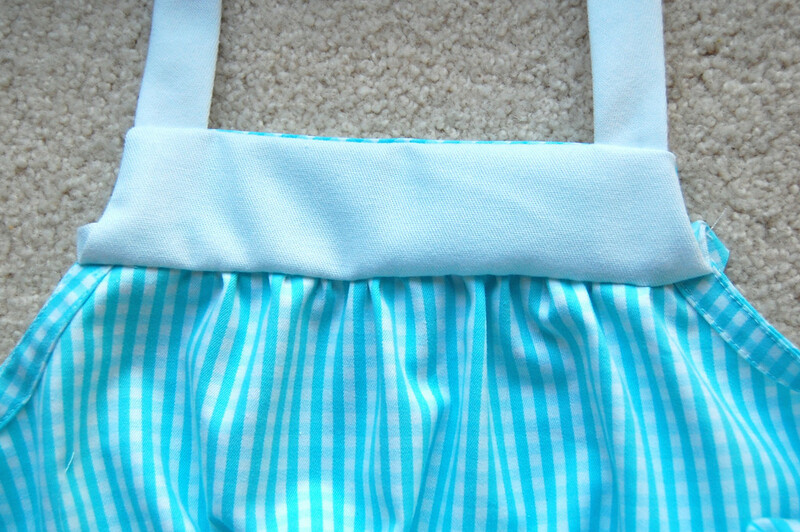 Fold the yoke over to the front of the dress, tuck the seam allowances in and baste. 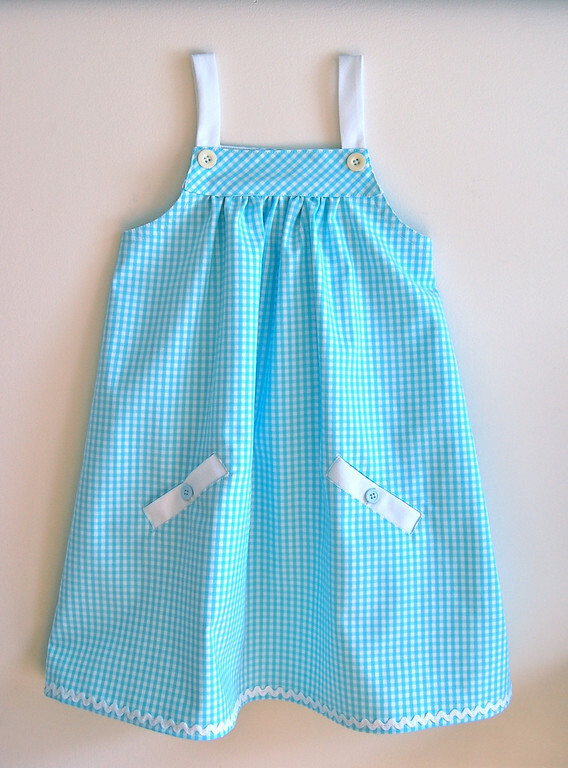 This is easy with a rectangular yoke but it does take a little more time with the curved yoke to tuck everything in. Repeat for the other yoke and the back of the dress. I am liking those welt/stand pockets a lot. So coyly subtle. Makes a dress feel grown-up. I love those pockets too. So professional looking. And I like rick rack on anything!! Love & blessings from NC! I love the pockets on this jumper! Hi-I hate to ask questions for fear that it is a STUPID one. So here is the but.........did you happen to mention what age group your measurements are for this tutorial? I have a 3 yr old and I am wondering(hoping) that the numbers are close. Thanks for your help. 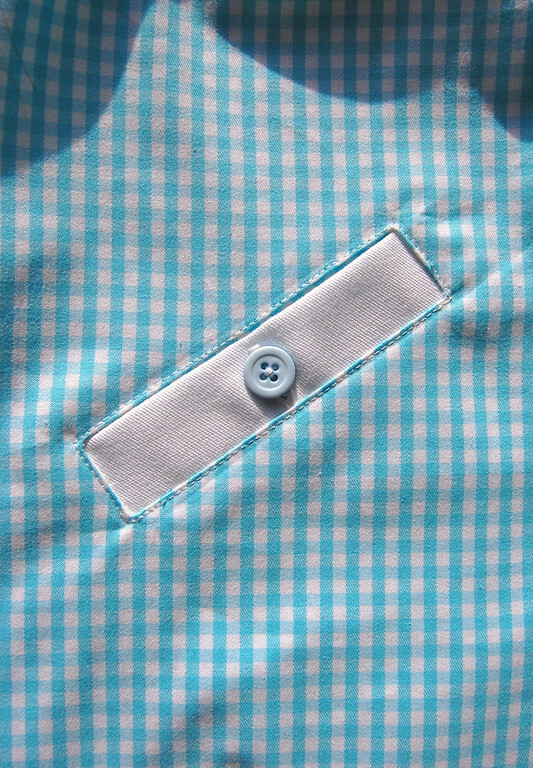 Anonymous: I'll be doing a series on pockets after this current drafting series, and welt pockets will be one of them!